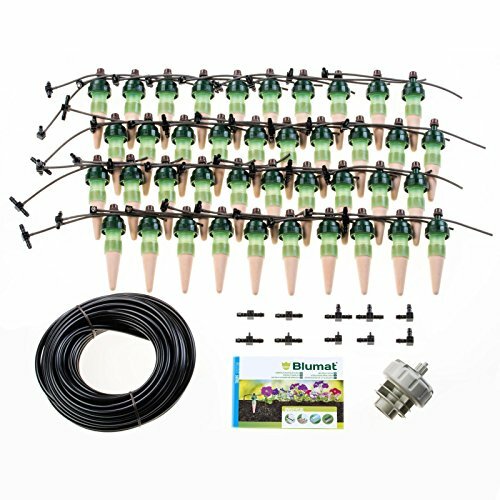 If you love plants, you'll love these Blumat kits. Each one includes: 40 blumat water sensors 15 meters of hose 1 pressure reducer 1 tee 1 elbow 1 hose branch 2 hose end-piece and instructions for installation Note: Blumat Classics (Juniors) and bottle adapters are designed for houseplants while Tropf-Blumat Sensors (the one's with the small adjustable brown knob on top) are designed for greenhouses, growrooms, decks, and outside gardens. Blumats Austria says "Please don't use the Tropf-Blumats indoors" because if hooked up to a constant water source and a pet, guest, or user-error somehow causes a run-away, it could damage an indoor floor, drywall, carpet, or furniture. We, and many others, do in fact use these systems inside ourselves, however, we are generally around enough that if a problem did occur, we would be able to notice a problem and fix it in time (not the case if someone is on vacation). We have many guides for being able to set these up the proper way and avoid a run-away or general mistakes. Please contact us for any help, we are always here to help make your life easier. If you have any questions about this product by Blumat, contact us by completing and submitting the form below. If you are looking for a specif part number, please include it with your message.